Ironically, I am a pathological liar because of church – I hide my wealth in order to fit in with my religious community. Every Sunday, I dutifully walk to the fifth pew just to the right of the pastor’s pulpit (furthest away from the chatty regular attendees, you know, the ones with the crinkly-eyed smiles who grip your hand extra tightly when saying, “Peace be with you”), grab a Bible, and immerse myself into the same scripture I’ve been reading since childhood. In any normal setting, this isolating routine would tend to ward away almost any ambiguous small-talk makers, but this is not a normal setting. This is the house of God, full to the brim with kind, caring people who genuinely want to know if you are happy and well — and also why you haven’t been to Youth Group in the past few weeks. During church small talk, instead of expressing my one hundred percent authentic self, I bring out the trusty façade that I’ve created, lovingly known as “Your Friendly Average Half-Chinese Half-White Middle-Class Tallish-For- My-Age Christian Teenager Who Is Most Certainly Not Hiding Anything.” And, as I settle into this all-too-familiar persona, the lying takes hold. I lie about the small things: what I do after school and what classes I take (as to not attract suspicion that my school offers a wide range of activities and learning opportunities for its students, and therefore must have a lot of money). I also lie about the bigger things: where I went during spring break (instead of Barcelona, I say I visited my family nearby, as to not attract suspicion that I actually travel quite frequently, and therefore I must have a lot of money). There are some things about myself I simply cannot lie about, and in that case, I just don’t tell the full truth. The most glaring example is where I go to high school (the center of my life besides God, my family, etc). Being the terribly crafty, sneaky person that I am, I have successfully managed to keep almost all of the regular church-goers from knowing the real name of my high school for the past nine months. The trick is simple: when asked about my education, I merely describe my school rather than flat-out admitting that I go to a $50,000 a year private high school called Horace Mann. “Oh, you probably won’t know my school, it’s just some random school in the Bronx, near Bronx Science, you know,” I tell the eager interrogators, prayer books clasped firmly in their arms. It is my witty and extremely twisted take on reverse psychology; by associating generic public high schools with my very own exclusive private high school, I am gently encouraging my fellow followers of Christ to believe that I am just like all of the other regular teenage church attendees: a non-rich, somewhat-Asian, well-meaning Christian who goes to a perfectly generic high school. However, as I have learned the hard way, under no circumstances lie about where you live. Because when youth group ends late, and it’s pouring outside, and the R train is running with half-hour delays, and you are forced to ask one of the few leaders who owns a car for a ride, I can guarantee that they will be utterly confused when they enter your address into Waze until it suddenly dawns on them: you do live in the rich part of Queens. This ultimately leads to a mortifying and unbearably awkward car ride in which the driver, frequently increases the volume of the faint strains from Christian pop station, begins to piece together the clues about your real identity. And no, shrinking behind the funky-smelling grocery bags from the Chinese fish market does not save you from embarrassment or guilt. Unsurprisingly I was miserable living in this constant lie! Maintaining this complex disguise of pure mediocrity was slowly deteriorating the original grounds of why I decided I should switch churches in the first place. The most ironic part about my entire dilemma was that I had left my old church, Redeemer Presbyterian Church, because I lacked the sense of community that I believe is essential to my Christian faith. 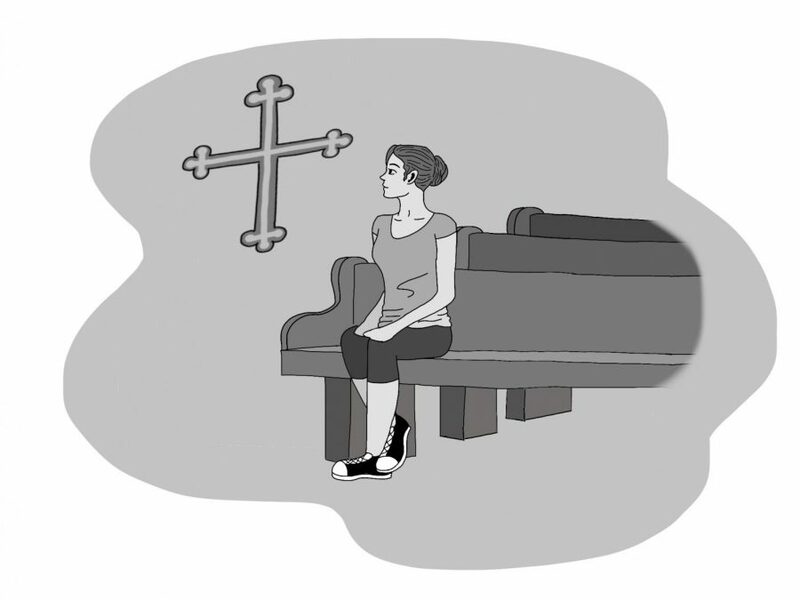 However, at my new church, I felt as if I were constantly skating on thin ice around a group of kind-hearted people who I was supposed to trust and confide in. I rejected their persistent appeals to take me out to Newtown’s famed Vietnamese Pho hole-in-the-wall restaurant, mumbling about having an enormous amount of homework or occasionally a “prior and unavoidable family engagement.” I was paranoid of someone discovering my wealth every time I stepped foot onto the church’s old wooden porch. Of course, bearing the weight of my insecurity and fear, the ugly truth hit me like a brick; my decline of their well-meaning invitations — from group worship and prayer sessions to after-church bubble tea pit stops — might imply that I think I am somehow above them and their “get-to-know-you” activities. As I thoroughly dissected my fake persona, I came to the only evident realization: my external, unchangeable identity factors made this superiority complex seem true. Although I am half-Chinese, I tend to look more like my father, who is white, and even in a community that is 90 percent Asian, with my brown hair and eyes, tanner complexion, and prominent facial features, my true ethnicity is unrecognizable to most. Put that into the mix with my socioeconomic status (thrown into the spotlight by my home in Forest Hills), and you have a the spitting image of a snobby, privileged teenager who only goes to church because her parents force them to. By lying impulsively, I had dug myself into a gaping hole of a mistaken identity fueled by the negative stereotypes that came with it. Frankly, I wasn’t sure if I could ever climb out. This depressing pattern of lying and avoiding becoming friends with my fellow Christians continued for several months, and I felt myself drowning deeper in my own guilt as my conscience berated me for repeatedly making the wrong choices. Until one Sunday morning before the service at Newtown, as I was concentrating on the Bible’s scripture per usual, so hard that the words on the crinkly paper bored into my brain, completely numb to all conversations around me, one particular verse struck a chord within me. “There is neither Jew nor Gentile, neither slave nor free, nor is there male and female, for you are all one in Christ Jesus.” (Galatians 3:28-29) Carefully, I scanned the lines over and over, and then I came to my second biggest realization at Newtown. This was God’s community! I racked my brain, scrambling to see how I missed this vital piece to the massive puzzle of my faith. Because what I had failed to acknowledge was that at the very core, going to church and being a Christian is truly about different people coming together to worship God, regardless of worldly influences, features, or possessions. It didn’t matter that we didn’t share the same socioeconomic class, race, or age, because above all we all shared the most valuable thing: our relentless faith in God. Struggling to face my privilege in my church taught me that we all need to engage in conversations about the wealth of our community. Our privilege is undeniable as Horace Mann students and it is often quite easy to forget or even ignore. The local public high school in my neighborhood can’t even afford paper for all of its students. The place is so overcrowded that students take shifts to attend: half go from 6am to 12pm, and the other half from 12pm to 6pm. Our inability to recognize and acknowledge all of the advantages we have been given to succeed as Horace Mann students is a problem that isn’t talked about enough. We should all work to have truly honest discussions about our privilege and how it affects the lives that we lead. I am still not the perfect Christian. But I am slowly beginning to open my real self up to my Newtown community, finally shedding my facade as I become more and more vulnerable with my new friends. More than ever, I am taking the first baby steps of an honest follower of Christ by exploring and dissecting my faith with plenty of loving Christians to support and help me. And most importantly; I can now say that I am no longer a pathological liar at church.